Now your child and her doll can have matching outfits with Fin Fun’s Maui Splash mermaid tail set for her 18-inch doll! Two-piece set includes fabric tail and top with jewel accent. Doll not included. Foster imagination with a mermaid doll tail set from Fin Fun! 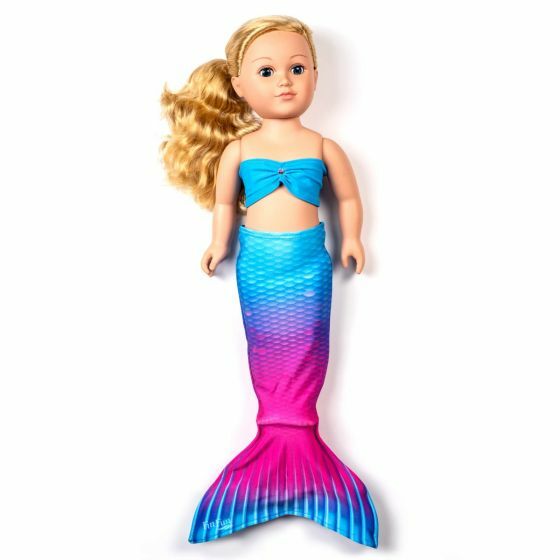 Whether you’re looking for mermaid gift ideas or know exactly what your little mermaid lover wants to add to her doll’s wardrobe, our Maui Splash mermaid doll tail set is sure to make waves! Featuring the same fade-resistant fabric and Limited Edition design as our full-sized version for kids and adults, our two-piece set for 18-inch dolls will transport your daughter and her doll to a tropical island, in a realm of imagination never before known.